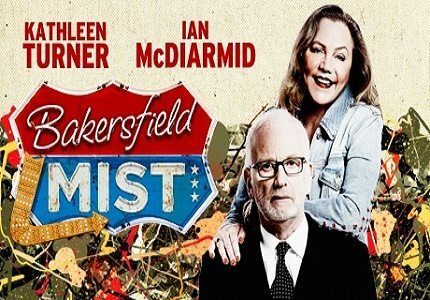 Bakersfield Mist, the long awaited UK production of the new play by Stephen Sachs, arrives at the Duchess Theatre from 10th May. The play premiered at Los Angeles’ Fountains Theatre in 2011, and proved to be a hit with critics and audiences alike. 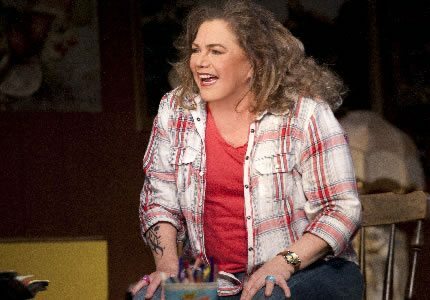 Now Kathleen Turner (Who’s Afraid of Virginia Woolf?) and Ian McDiarmid (Life of Galileo, Faith Healer) top the bill in this summer’s production. 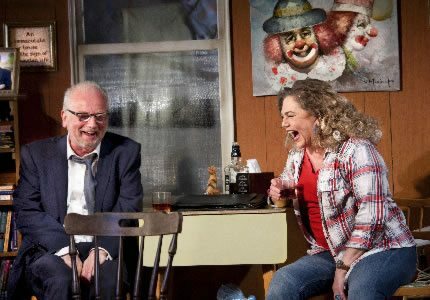 Based on real events, the play tells the exceptional story of fifty-something Maude Gutman (Turner) who begins an unlikely, and eventful, relationship with the art world. Maude is an out-of-work bartender living in a trailer in Bakersfield, which she has adorned with tacky memorabilia and cheap kitsch. On a visit to her local thrift store an ugly painting catches her eye, and she cheekily buys it as a joke. A high school art teacher suggests that it might actually be an undiscovered Jackson Pollock, and even though Maude only pays $3 dollars for it she soon becomes convinced that it’s worth millions. She can’t shake the idea so decides to seek expert advice from an art consultancy. The cynical and pompous art historian Lionel Percy (McDiarmid) travels to Bakersfield from New York to value the painting. He believes the trip will be a waste of his time and dismisses Maude as naïve, especially given the tawdry décor of her trailer. But he gets far more than he bargained for when the pair begin a debate on class, reality, and the values we place on each other. Bakersfield Mist is directed by the award winning Polly Teale, best known for her work with the theatre company Shared Experience. The play runs from 10th May to 30th August at the Duchess Theatre. Whilst the show’s subject matter isn’t offensive for young children, the show is geared towards older children and adults. Teenagers may especially enjoy its quick witted humour.